On the first anniversary of the Liverpool Street Station T-Mobile Dance, the final installment of the latest T-Mobile campaign has been unveiled. 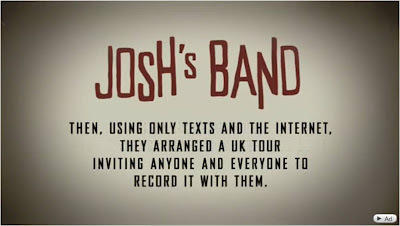 'Josh's Band' continues the Life For Sharing campaign and a full length ad took over a whole break during Celebrity Big Brother on Friday. The resulting single 'Come With Me' has now been released on Universal and is available through iTunes here. For the tour everyone was brought together by text message and mobile internet and the TV ad / YouTube video includes snippets from all of the contributors and has everyone listed at the end. This campaign brings lots of ideas together from the YouTube Symphony Orchestra to the fortheloveofWispa mass performer collaboration to Danny Wallace's 'Join Me' accidental cult, however it has the feel good factor again, is very shareable, brings a new angle in crowd creating an ad track that can then be bought through iTunes - and most of all continues to invigorate the 'Life's For Sharing' proposition. Nice article. I love the approach of T-Mobile to connect people (even if it's Nokia signature, only TMob manages to illustrates it).